Per Zen Studios video game pinball standards, each Star Wars Pinball tables will include; interactive 3D characters, unique gameplay elements, online global leaderboards, friend challenges, local hotseat, and online multiplayer features. The developer has also announced that the Empire table in Star Wars Pinball features a new checkpoint system that saves your progress during the game’s missions. If you happen to run out of time, or experience a ball drain, the checkpoint kicks in and the next time you start the mission you can pick up where you left off. If you have not yet done so, make sure to check the Star Wars Episode V: The Empire Strikes Back trailer embedded below to get a taste for all that Star Wars Pinball has to offer. 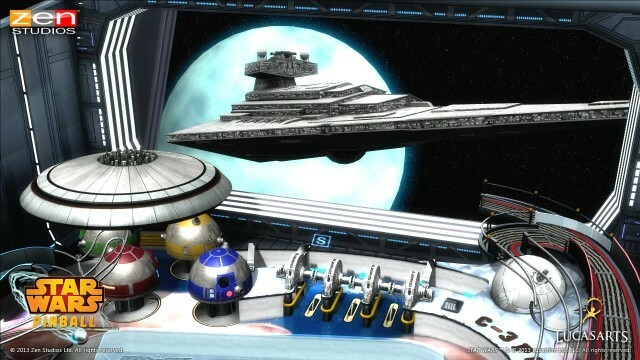 Over the course of the this year Zen Studios plans to launch a total of ten tables in the Star Wars Pinball collection. We will keep an eye out for an official announcement on what the themes will be for the remaining seven tables and let you know as soon we hear anything.